In 2017 we were able to serve 90 families and kids with our programs and support efforts. In 2018 we served 138 families and Warriors through our programs! A Sensory Movie is a movie with the light level increased slightly and the sound level decreased. Families living with Sensory Processing issues can enjoy a family outing to the movies with these accommodations. Sensory Day at the station is for first responders, parents, caregivers, and individuals with developmental and/or cognitive impairments. Desensitize and prepare special needs individuals to appropriately interact with First Responders in a fun and stress free environment. 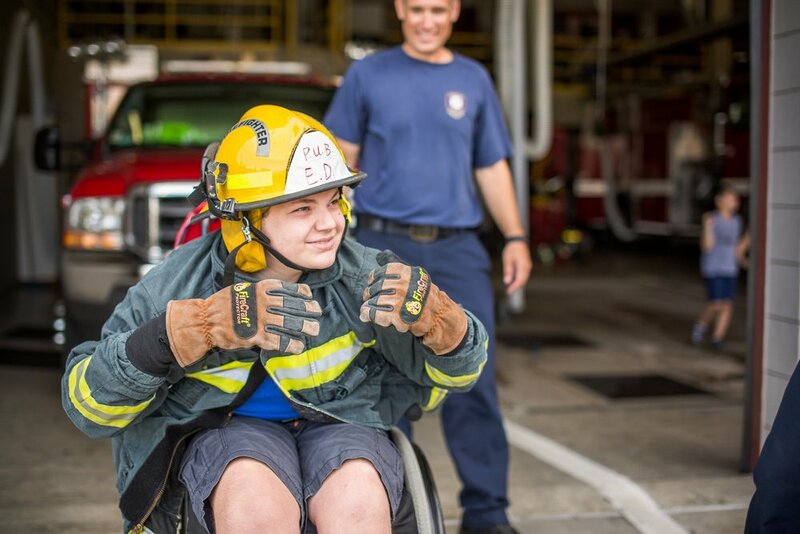 Give First Responders an opportunity to gain experience interacting with individuals affected by special abilities and other disorders in a real-time environment. Sensory Day at the Station will be held monthly and geared for children of all ages and all abilities. Each session is limited to 5 special needs individuals. Neuro-typical siblings are encouraged to attend as well. RSVP is required when attending one of these sessions. Families are encouraged to utilize these sensory days at the station visits as often as necessary to effectively acclimate their special needs family member to first responders and department vehicles. Questions? Email and RSVP to Shannon at scbwarriorproject@gmail.com. The Brave Warrior Project has partnered with Riverfront Rock gym to offer an adaptive rock climbing experience for our warriors with special abilities. Adaptive climbing involves modifying the climbing experience in order to capitalize on the climber’s strengths and abilities. Climbers of all abilities constantly need to adjust to the environment. What is a Warrior Box? A Warrior box is a box full of puzzles, everyday toiletries, protein bars, gas cards, coffee cards, and so much more. Do I qualify for a Warrior box? Any child 0-19 living in Chelan, Douglas, Grant, and Okanogan County that will be spending an extended length of time over at Pediatric hospitals in Seattle or Spokane. How can I get a Warrior Box? To start the process complete the request support at the top of our website and we will email you an application. Please note: Due to confidentiality guidelines, parents/guardians and hospital staff are the only individuals authorized to submit a formal referral. If you have questions about this policy, please contact, Erica at bwarriorproject@gmail.com directly to discuss. are designed to help people cope with all aspects of a diagnosis by providing a safe environment to share experiences and learn from others who are facing similar obstacles. Below are reason why joining a support group could have powerful benefits on the success of treatment and recovery. Support groups are also offered to caregivers, family members and friends who may need encouragement while learning to cope with the diagnosis of a loved one. Buddy Art is a program which provides Art Activities for kids with special needs and/or physical disabilities while also pairing them up with a neurotypical developing peer. Our vision for this program is to give our children with special needs something to do outside of school and also provide a way for all of our children to socialize with one another! Art has been proven to provide a therapeutic affect on both our emotional and physical well being. Here are 5 reasons how Buddy Art can impact a child. 1. It allows a child to express themselves without having to be verbal. 2. It facilitates connections with peers. 3. It encourages turn taking. 4. Buddy Art can help children grow confidence. 5. Buddy Art can also help improve motor skills and control, hand-eye coordination and muscle development can be achieved through the different modalities of art. These are just 5 reasons Buddy Art can help. There are so many more reasons! The Brave Warrior Project will be announcing dates throughout the summer. If you would like to donate please just go to the Give Now button in the top right corner. If you would like to volunteer to be a buddy please email us.